An umbrella company for consultants. How does it work? 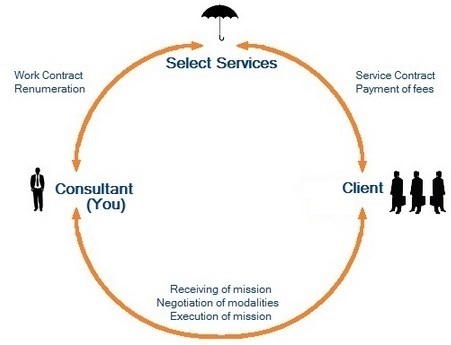 Being an independent consultant, Select Services will act for you in establishing consultancy projects. Select Services acts as employer for sub-contracting companys and individuals. You will therefore be employed by Select Services. We will establish an employment contract for you that will allow you, as a contractor, to take advantage of similar benefits as to being self-employed, but with the status of an employed worker taken on by an employer. The hiring company has no personnel management or contract management responsibilities; it is invoiced for the service completed by the contractor. Select Services helps to ensure that you receive the best possible net pay and gives you the opportunity to claim allowable business expenses. You determine yourself when you work and when you don't. Select Services' commits itself to serving you with the highest of standards of quality. 4. The consultant receives his fee as salary from Select-Services , after deductions for social and payroll taxes.